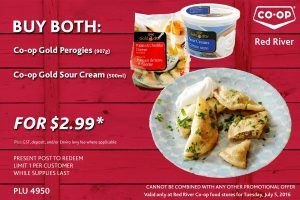 It’s Tuesday – time for a deal from Red River Co-op! Easy to redeem – at checkout just show the picture on your phone with the plu#. The deal is valid today only and it’s one per person. It’s valid at the 3 Red River Co-op Food stores in Winnipeg. For $3 you get perogies and sour cream today.